Features of Double Check Valve: Since both the plug and socket have a value, there is no leakage of gas, oil etc. from either the socket or plug ends when disconnected. Since they are manufactured by an especially high precision machining process, air tightness is a high 10-4mmHg / sec. The hose doesn't twist. 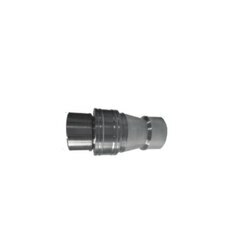 Designed for use in a wide range of applications.